You can and should spend more time “drawing” with tile than drawing with a pencil when most of the details in the mosaic are about the size the smallest piece of tile that can be cut. If the smallest details of your design are larger than multiple tiles, then you should draw a detailed pattern, but most mosaic plaques are small enough so that nearly all lines are affected by limitations in how small the tile can be cut, and drawing patterns for these can be counterproductive and cloud judgment. HERE’S WHY NOT TO DRAW FOR SMALLS: Every element in your drawing will need to be a multiple of tiles wide or a fraction wide. Until you understand those multiples and fractions in practical terms of what you can cut and what looks good, your drawings can lead you to make bad design decisions and artificially cause you more stress than is necessary without teaching you more about rendering in tile. How To Transfer A Pattern From A Digital Image. 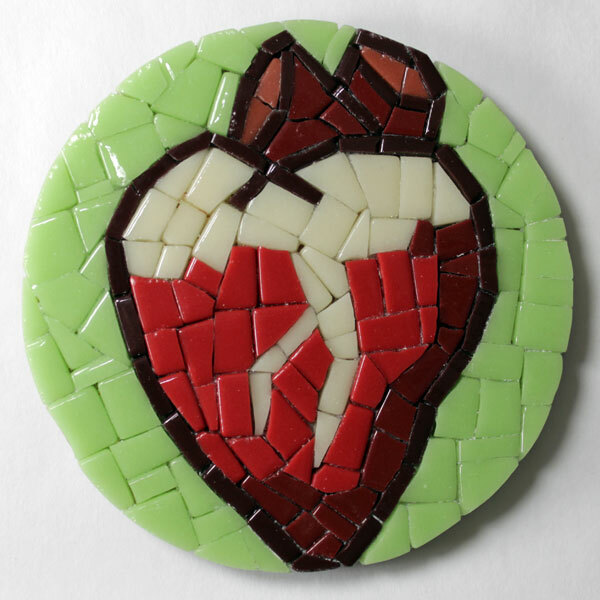 Mosaic Coaster with Heart Design was made using a photo of an ox’s heart downloaded from Google Images as the pattern. Is there any doubt as to whether or not this mosaic is an original interpretation? Would anyone try to argue that it is a copy of the photo? What is the alternative to drawing if the beginner is only interested in making original art? Answer: Select a model from a large number of images (such as hundreds or thousands looked up online or your own photos), and then render loosely with tile on top of that image making simplifications as needed. This rendering process (“drawing with tile”) can teach you things about the image that the pencil is unaware of. It is a much more taxing interpretation than drawing, and it has its own vocabulary. Here are the steps for making a pattern quickly from a photo or image,. The details follow. And an explanation about why this method works better than drawing studies of that image. View a large pool of images, such as can be had in Google images, your own photos, books, and encyclopedias. Select an image with strong lines and iconic shapes. Modify the image as desired. Combine multiple figures if desired. Resize the image to the size of the mosaic backer. Transfer the pattern to the backer. Render LOOSELY on this pattern making simplifications as needed. Mosaic patterns can be resized digitally, but I have written some instructions for resizing a mosaic pattern using a grid while you copy it onto your backer board. You can combine figures from different photos by drawing or tracing them and then cutting them out and gluing them together in collages, or you can do it digitally in Photoshop or other image editors. I prefer the digital method because you can resize the different figures as needed before combining them in a scene. Photoshop is also useful for converting images to black and white without making the images too dark. Use Photoshop’s Adjust Sharpness tool and Adjust Brightness/Contrast before using Photoshop’s Convert To Black And White so that the black and white image is created has maximum contrast. That will help make the image be more outlines than dark shapes, and we need distinct outlines to transfer the pattern onto the backer. Photoshop was used to crop out a detail of Franz Marc’s fauvist painting “The Large Red Horses” and convert it to a black and white image that emphasizes outlines. The outlines and curves are what you want to transfer to your mosaic backer. Drawing a pattern by hand or by using the grid transfer method is a great exercise because it enables you to become familiar with the lines and see the image in your mind. Drawing also is an opportunity to interpret what you are seeing and make original art. In fact, for someone like me, the drawing becomes an end unto itself and almost immediately has more detail than can be rendered in the size of tile I will be using. Overdrawing the details is just part of the problem. The more time spent drawing a pattern, the more likely the artist is to try to hold to it religiously rather than improvising more freely with the tile when needed. This makes the actual mosaic work more tedious than it needs to be, and it can result in awkward results when you attempt a detail in a way that doesn’t take into account the work lines of the tile or what shapes are being used or some other aspect of the tile. Staying true to carefully rendered patterns can have you scraping off gluey tiles and redrawing the detail in a way that matches the flow of the tile –or pulling tiles off your mesh, mounting tape, or tile paper. I call this mistake “Following the pattern into a detail that can’t be rendered,” and it can happen even when you work indirectly and lay the mosaic up in advance. Of course, this doesn’t happen often on large mosaics where the tiles are tiny compared to the details being rendered, but for small mosaic plaques and icons, the resolution issue affects nearly every single tile. Don’t be a slave to your pattern. Don’t let your pattern interfere with the tiling process and the rendering that happens there. The easiest way to do that is to not become emotionally invested in your pattern, and many artists cannot do this very well with their own drawings. Avoid the issue by using a photo or borrowed image as a starting point. Draw with tile, not a pencil. The “Mosaic Coaster with Heart Design” shown above was made using a photo of an ox’s heart downloaded from Google Images as the pattern. Is there any doubt as to whether or not this mosaic is an original interpretation? Would anyone try to argue that it is a copy of the photo? Look at the width of different features in terms of tile count. Most everything is one or two tiles wide. How would drawing the photograph help a novice make those design decisions? Wouldn’t a novice be better off improvising on a copy the photo itself? Wouldn’t anyone attempting to draw a meaningful pattern need an experienced eye for how the tile can be cut and arranged? This entry was posted in Step by Step Instructions and tagged beginner, pattern, photo on December 20, 2015 by Joe Moorman. You might be correct for all I know (with my lack of formal training), but isn’t “reverse” used to describe methods where the tiles are inverted? I suspect that different people/studios may be using these terms differently.